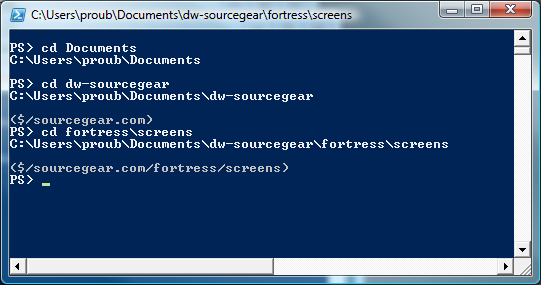 I've been toying with the idea of integrating Fortress and Vault into Windows PowerShell. PowerShell is, at heart, a scripting wrapper for .NET libraries. Combining that with the Vault Client API (or the equivalent Fortress Client API) seems like a no-brainer. Creating a provider that would enable Vault/Fortress repositories to be browsed as a file system. You could then just copy files to check them in and out, etc. Re-writing the Vault/Fortress Command Line Client as a series of PowerShell cmdlets would be a reasonably straightforward task. For today, not having done and PowerShell scripting before, I'm opting for the last one. 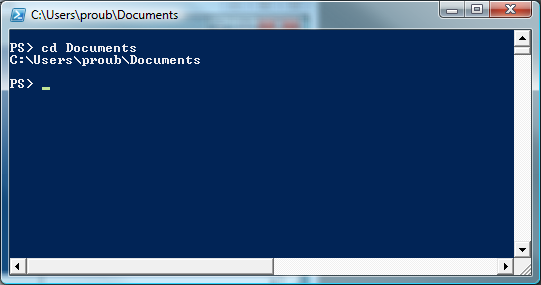 In particular, when I'm in PowerShell, it would be nice to know with Vault/Fortress folder is mapped to my current directory. This is particularly helpful when I have multiple branches of a project in play, and want to see which branch I'm playing with right now. 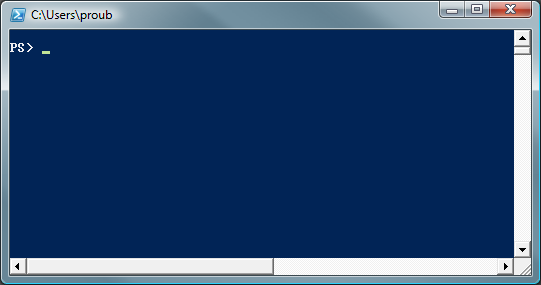 At first, we see a typical PowerShell prompt. In my Documents directory, roughly the same thing. 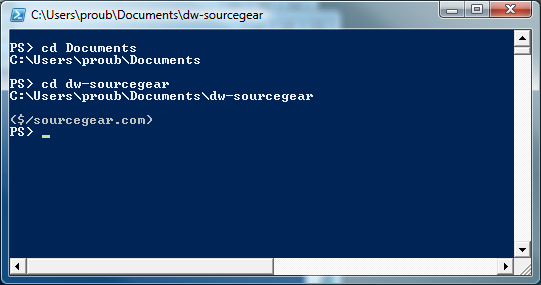 But Documents\dw-sourcegear maps to the Fortress folder managing sourcegear.com's files. And we see that mapping, grayed, above the prompt. Moving further into the tree, the Fortress mapping follows along. The fun part is that this took just a few lines of PowerShell code. The API does all the heavy lifting. What's the catch? This is not the most-comprehensive approach I could have taken -- it's more a proof of concept. We're piggybacking on the Vault/Fortress Command-Line Client's saved login info, so you must have run vault.exe with the REMEMBERLOGIN option at some point. We're also tied to the previously-selected repository. #  did we successfully log in? #  your profile.ps1 to work properly. #  If there is no mapped folder here, an exception will be thrown. #  Catch it, note the lack of a mapping, and continue. $pval = "(" + $sgPath + ")"